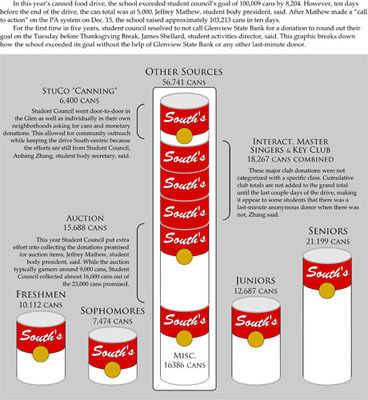 In this year’s canned food drive, the school exceeded student council’s goal of 100,009 cans by 8,204 cans. However, ten days before the end of the drive, the can total was at 5,000, according to Jeffrey Mathew, student body president. After Mathew made a “call to action” on the PA system on Dec. 15, the school raised approximately 103,213 cans in ten days. For the first time in five years, student council resolved to not call Glenview State Bank for a donation to round out their goal on the Tuesday before Thanksgiving Break, James Shellard, student activities director, said. This graphic breaks down how the school exceeded its goal without the help of Glenview State Bank or any other last-minute donor.